Light a 30-day candle for your intentions! A 30-day candle for your intentions! 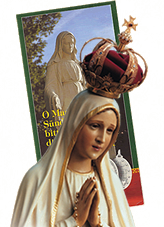 Light a candle for 30 days and you will receive a Miraculous Medal with novena. 1) A Miraculous Medal (size: 1.5 cm x 2.5 cm) already blessed by a priest and a novena. They will be mailed to your home address. 2) When you light a 30-day candle your name and prayer requests will be included in the book, “Mother of God, Heed My Requests” and thus the Miraculous Medal Community (all the persons with a lit candle) will also be praying for your intentions. Please do the same by praying for the intentions mentioned in this book. 3) You and your intentions will be included in a Mass which is celebrated during this period. Your intentions will also be included in the prayers of the nuns of nine contemplative communities that pray and make sacrifices for our apostolate. Now carefully double check the information and click here. O Lady of the Miraculous Medal, I ask that this candle I am now lighting may burn before Thee as a sign of my request; give me the graces that I need. I offer my prayers, sufferings and good works for my intentions and the intentions of all those for whom a candle is now lit. Your prayer requests will remain absolutely confidential! I agree that my data be used in accordance with the Data Protection Act exclusively for the ends of the association.